Good. That creates a healthy rotation for the top spots and everyone has a chance to get better rewards. All without having to befriend their competitors outside the game via data-mining third party chat apps. 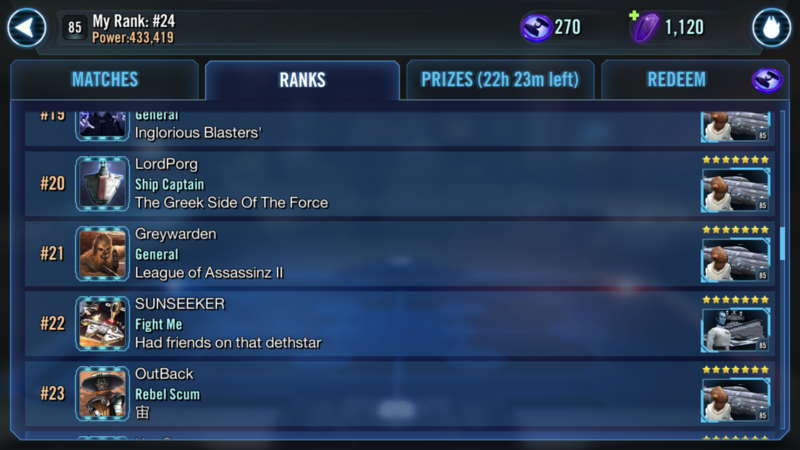 I so wish there was a Marvel version of swgoh. Keep the game exactly the same, just replace all the Star Wars characters by Marvel ones, remove Ships and change the name. It's the first Legendary non-capital ship in the game, of course it's powerful. Did you really expect different? Why should the most iconic ship in Star Wars lore that people have wanted since the day ships was announced not be that powerful? You have to build a rebel fleet around it to unlock it's full potential, so it's not a plug and play ship like Hound's Tooth was in it's prime meaning you could argue it's not powerful enough. It's like Darth Traya in her prime, unless you were using her with the Triumvirate she was just another good character. Because this "iconic" ship already exists in the game... twice. It would be more iconic if the first one didn't need rey (lol) and then the 2nd one look disfigured and require young solo movie that many didn't see. We finally get the real Falcon but it does feel less iconic being the third one, even if its the only real one. But man, they really made it op. Like super op. 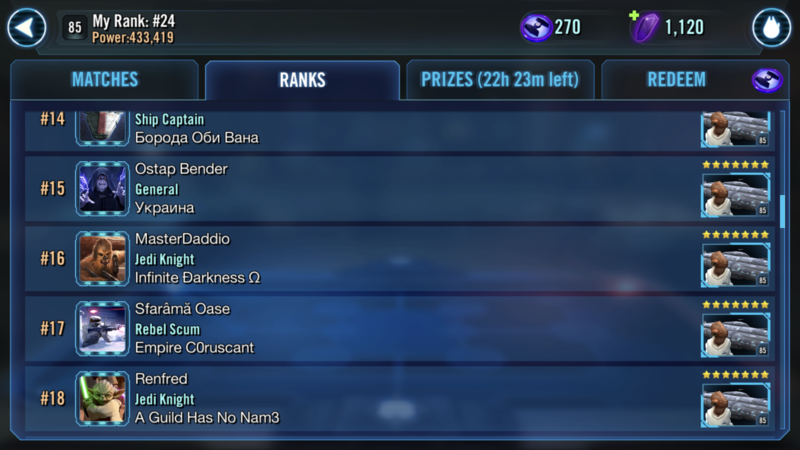 it can be strong and not op, but CG wanted em cashies. You're telling me Jedi Luke won't be iconic then? The Falcon was far from a cash grab. 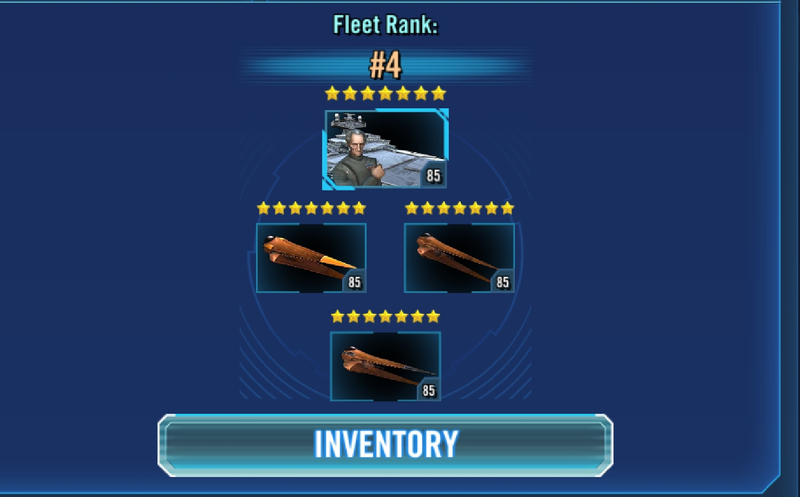 If you wanted it then you farmed the Bounty Hunter ships the second they became farmable. You pick and choose what you want in this game. So you knew when bh ships became available that they were going to be used for an unannounced ot falcon. Wow what are next weeks lotto numbers. Next week's lotto numbers are: "you should farm Bastila Shan (Fallen) and Canderous Ordo. Today. Right now. Gogogo." Is Poe's daze on his basic (on TL ships) bugged? Should it prevent counter attacks? How about when it is first applied on say a reinforcing Boba's ship ? Should daze on ships also prevent them from being called for an assist? 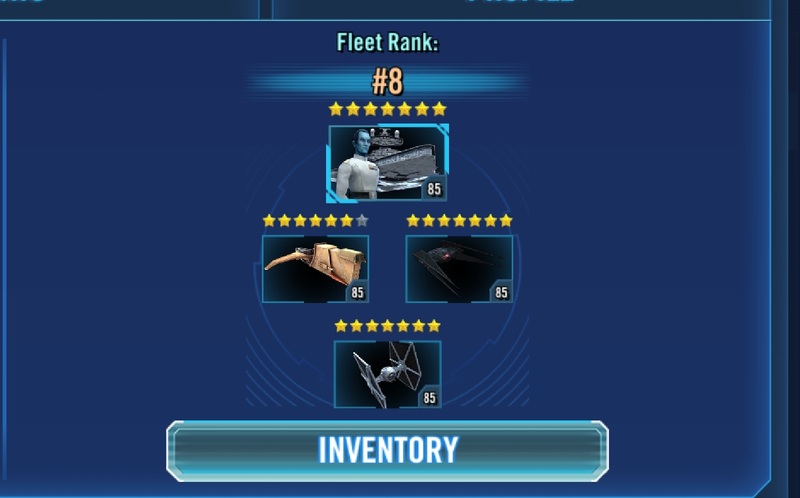 Because I was fighting a Ackbar/MliF fleet and I got daze on Biggs and I swear he then later assisted while still having daze on his ship! That's basically what Marvel Strike Force is. Though I tried it and it just didn't grab me for whatever reason. What makes this game special is the leader abilities and the factions. I've tried the Marvel and DC versions but there's little to no team building strategy. I tried it too and didn't like it (and I was an M:AA player). I did mean an exact copy though, not something similar. What makes this game special is the leader abilities and the factions. That is one of the most euphemistic descriptions of chaos I read in the last couple of months. Very close to "No-deal Brexit provides many opportunities". 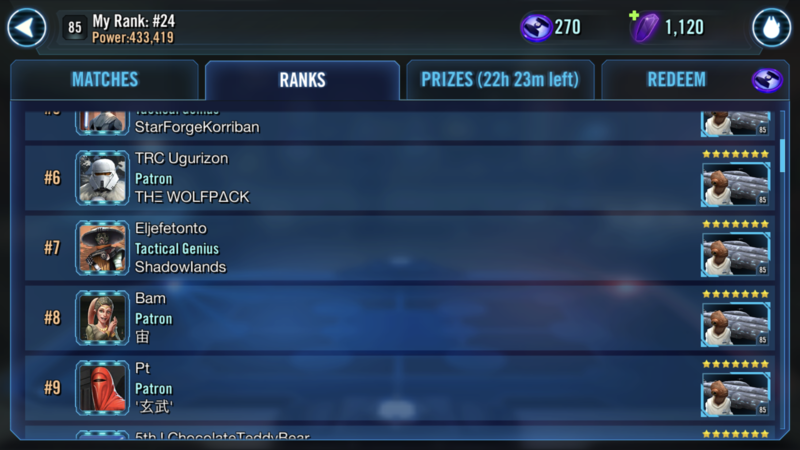 Many people just hit the "battle button" and do not bother to figure out who climbs when. They seem to be incapable to understand that their behaviour actually deprives us of the optimal rewards. And CG like chaos and mindless spending. They live off of this. It did the Kessel Run in 12 parsed.... that is all. Han Solo was a General of the Rebel Forces. His taunt is easily dispelled if there's no breach in play. And his cooldown on his special + his low speed means that if you dispel it you've got a turn or two before he can re-apply. (yes I know he gets tm when allies are hit). HT isn't some mythic beast that needs divine intervention to beat - it was killable before HMF, and with HMF it dies as easily as Biggs. It actually fills the weakness Home One has at the moment. And besides its the most popular and overrated ship in the game so it should be powerful just like CLS. Popular but overrated. I don’t need to say more. And I don’t need the CG goons explain to me that I just didn’t find the right strategy yet or haven’t built out my fleet brought. Because that just translates into: you have not spent enough money yet. The diversity is AWESOME!!!1! Some of them even have the ships in different places in the picture. WOW!! Please note: you can tell by the times on both, that these were taken just now, 2 minutes apart. This is not some "cherry picked" sample. And then CG (and apparently some of the posters here) wonder why people can be bothered with fleet 2.zero. Is the BH team the only one youve used to beat falcon? 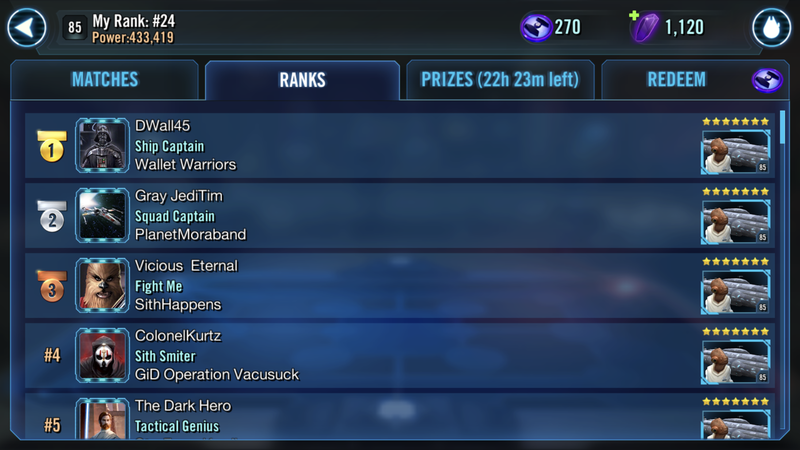 My shard is currently 49 of top 50 falcon squads. And I cant beat any of them. 58 is where I am stuck. 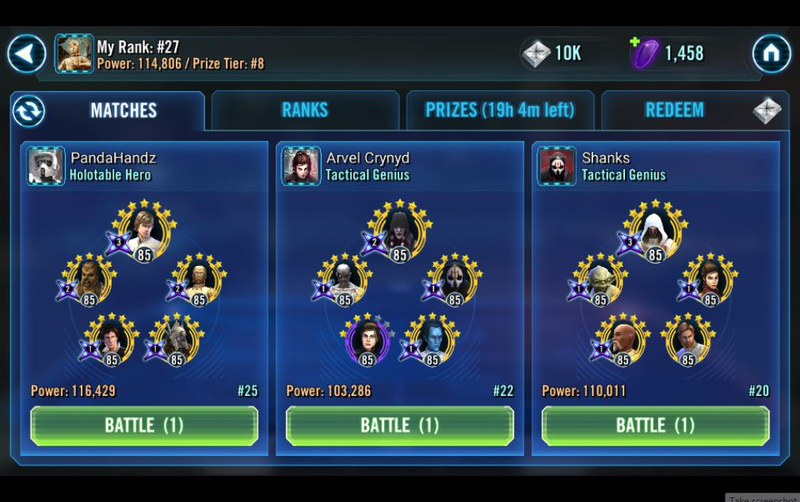 I want to be in a shard where an unzetad 4 star black bastilla can hold on the top 30 haha. Anyone else noticing the **** assists, and then that assist calls another rebel to assist? So you get hit three times each time someone attacks. 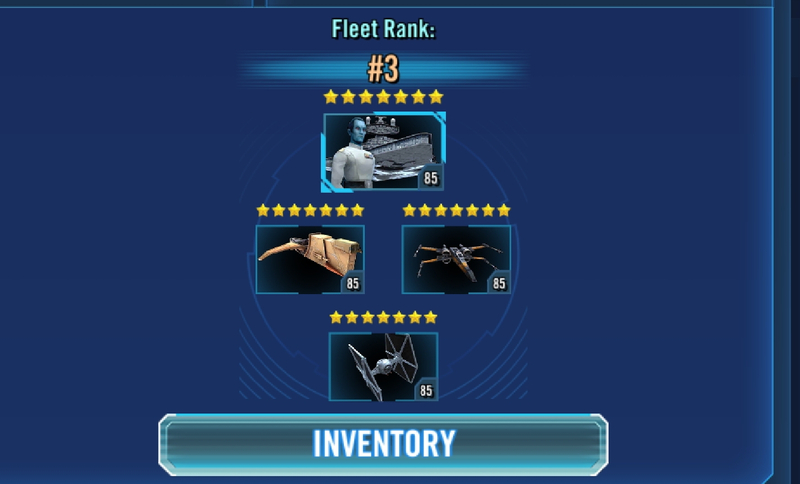 And when Biggs does his special 2, you get hit up to four times? Once for Biggs. Once for his assist, once for **** assist (if **** was not the assist for Biggs), and then once for Rebel assist to ****. That is why **** is overpowered. The dodge is fine. But the double triple assist is ****. 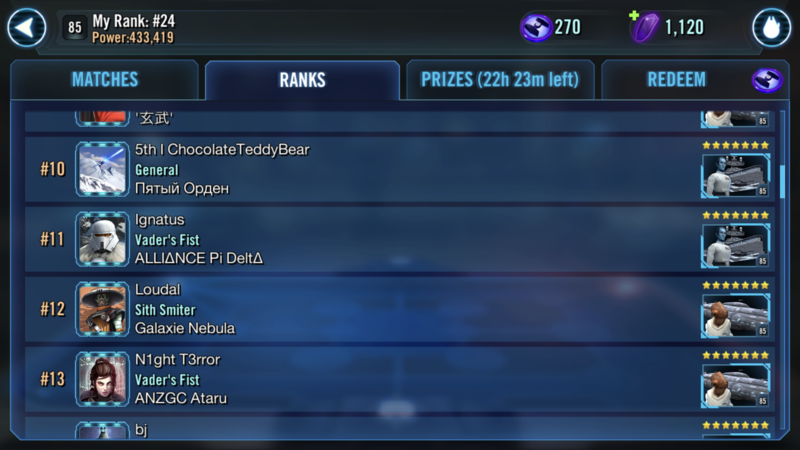 That is why Ackbar has the top 25 slots in the Arena. Apparently the forum filters my Millenium Falcon abbreviation as something else. So the references are to MilFal assists. Not a curse word. Well, the last one was a curse word. MilFal assists are bullshirt. Yes, thats why its meta. It is the best team currently. So what? HT itself also dominated arena for a while. Biggs tfp vader was also dominant for god knows how many months. Get it or accept that youll rank after them. Sorry to all you guys defending the falcon, saying it not OP, lol. You fanboys are all the same. That one team is dominating fleet and is almost impossible to beat, unless you’re fighting **** team with **** team. Ever since the ships update that scaled down to 3 ships came out the arena had been very diverse. Lots of teams rotating out of top spots. Now it’s all **** teams. 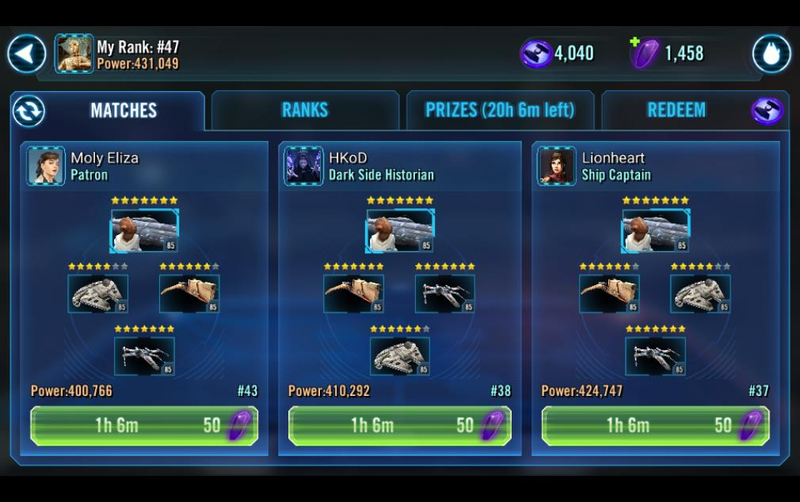 Defend all you want but the OT falcon is way too op with a home one lead, all there is to it. Getting attacked 6/7 times in one turn is too much. It’s dumb. Maybe you should just quit. It looks like you hate the game, and you’re not very good at strategizing apparently, so maybe the best option is for you to focus harder or quit. Just a suggestion.